In the battle of the street-cart food vendors, whether kosher or halal, Mexican or Greek, beef always seems to be on the menu. Newbies on the streatery scene are saying that when they try to set up camp on a busy corner they are often threatened by a group of veteran vendors they call the "Halal Mafia," according to the New York Post. "They had their friends park a truck in my location because they were trying to much me out," Clive Dennis, who manages the Little Ochi Hot Spot Jamaican-food cart, told the Post. "It's like a mob thing -- these halal guys think they're the only ones who should be selling food on the street." If threats don't work, the Halal Mafia guys call 311 and start making health-code-violation complaints, Dennis said. After battling with them for months, Dennis finally got them to leave him and his cart alone. "You have to stand firm with these guys," he said." Olivia Cardosa, meanwhile said she's been losing the fight. When she set up her Mexican truck on West 43rd Street between Sixth and Seventh Avenues, she was ambushed by a competitor who worked at a Greek food cart. "She said we couldn't put our cart here," said Cardosa. "Then she jumped on our cart's hitch trying to prevent us from putting it on the sidewalk." One passerby caught the whole incident on video, which was posted on MidtownLunch.com. Cardosa said when she arrived at her spot last Monday, three giant planters had been cemented into the sidewalk where she would normally set up. The building's landlord called it vandalism. 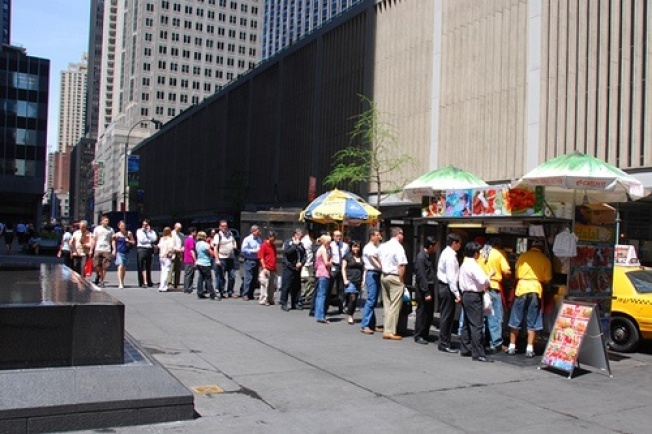 Cardosa said it was "the halal guys." Erez Ella, who just set up his kosher-food truck on West 46th Street between Sixth and Seventh avenues, told the Post he has been threatened since the beginning. "They told me they were going to bring 10 carts and block my spot," he told the paper. The next day his parking garage told him they didn't want him there and that she should sell his cart to them. Two days later his truck was dented all over. The Halal Mafia had struck again.